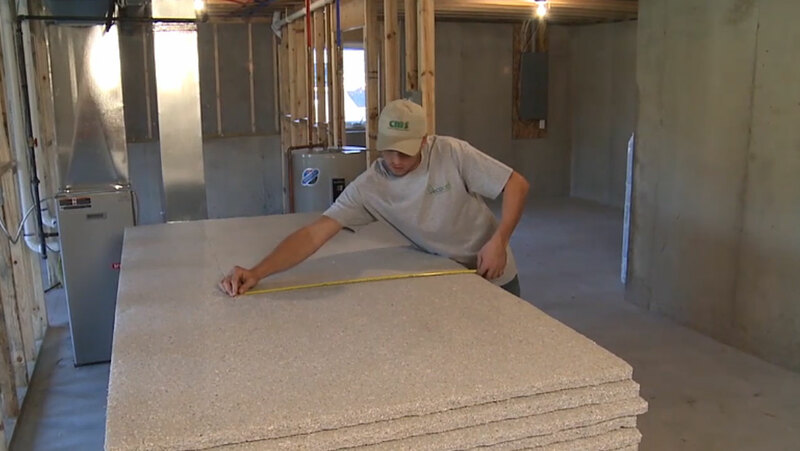 Blanket sizes: 48" x 96" or 48" x 108"
ECOCELL blankets are commonly used to insulate basements, crawlspaces, poured concrete and cement block rooms and other areas where framing and wallboard are not desired. Easy to install, ECOCELL blankets are an ideal choice for insulating and meet code requirements. ECOCELL materials contain no harmful airborne particles, are made with an EPA registered fungicide to resist mold growth, and do not itch or irritate skin like some fiberglass insulation. ECOCELL blankets are a Class A fire rated material according to the standards of the International Residential Code. ECOCELL blankets can be left exposed and do not need to be covered with drywall, paneling or other material because of this rating, resulting in less cost for the consumer compared to other insulation materials. ECOCELL blankets thermally outperform many fiberglass products by reducing air infiltration. The dense fibers of ECOCELL blankets not only reduce air infiltration, but control and deaden sound, reducing airborne sound transmission from room to room and blocking outdoor noise for a noticeable quietness. A quieter, more air tight home is achieved with ECOCELL insulation products. ECOCELL blankets contain a minimum of 70% recycled content. ECOCELL products are made from a combination of recycled and renewable fibers, the majority of which is post-consumer recycled newspaper. By converting recycled paper into the cellulose fibers used in ECOCELL products, the paper is kept out of landfills where it has the potential to pollute the environment. The manufacture of ECOCELL products produces zero scrap. In addition, customized recycling programs can be set up to recycle ECOCELL products. The most important green attribute of ECOCELL products to the homeowner is the savings on energy bills*.